I have some unbelievably exciting news! 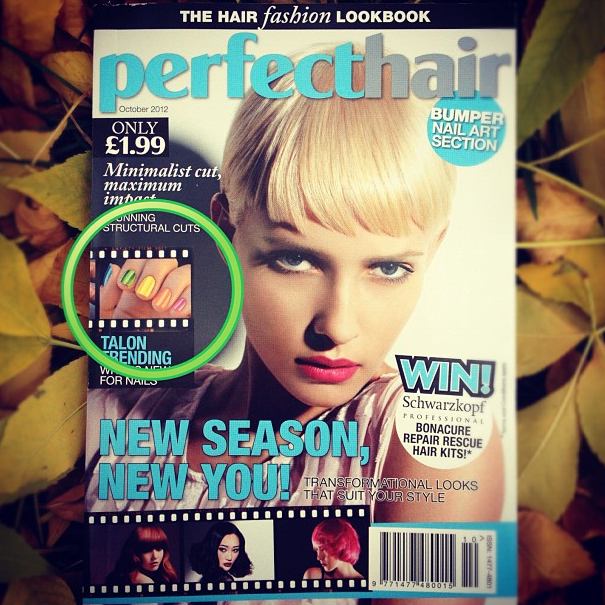 My nails have been published in a nail bumper feature of UK magazine, Perfect Hair. Not only are there 10 pages inside the magazine, but my colorful nails from the Striped Skittle Gradient post are featured on the cover! It just goes to show what hard work can do. What a perfect ending to a year's worth of nail art! Oh wow! Congratulations, that's such an awesome achievement, and well deserved of course. The Anchorman quote made me laugh. BRING THIS GIRL A BEER! She has to celebrate!!! Congrats! This is SO a big deal! Congratulations! That is so cool. I would make everyone I know buy a copy and read it. I would want to buy all of them myself. I hope you don't mind my asking, did you enter a contest to get these in the mag? I don't mind at all. I didn't enter a contest. One of their representatives contacted me by email. Wow! Nice - what a wonderful celebration of what you do! Congratulations! Yay! You deserve it girlie huge congrats!!! Yeah I love Ron Burgandy too hehe! Congratulations! Your nail art is totally creative and deserves the recognition! Wow!!! You go girl!!! You seriously deserve it. So glad for you. Are you going to try to score a hundred copies of the magazine? Yeah they sent me one. I'd be happy to send you an email with the name/email of the person I've been working with if you'd like. Let me know! That is AWESOME! You must be so stoked! !